This handy tool set allows you to safely open your iPhone 4 / 4s / 5 / 5c / 5s / 6 / 6 Plus and avoid scratching or damaging delicate iPhone parts such as the screen or the casing. 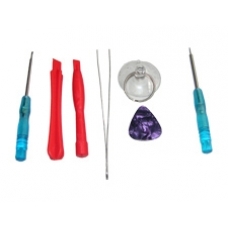 This complete opening kit includes 2 opening tools, a cross head screwdriver, screen removal suction tool, a plectrum, a pair of tweezers and the mini Torx 5 sided pentalobe security screwdriver which is specifically designed for opening the iPhone 4 / 4s / 5 / 5c / 5s / 6 / 6 Plus. * Includes Pentalobe Security Screwdriver.